NeuWrite West -- How might a brain detect magnetic fields? 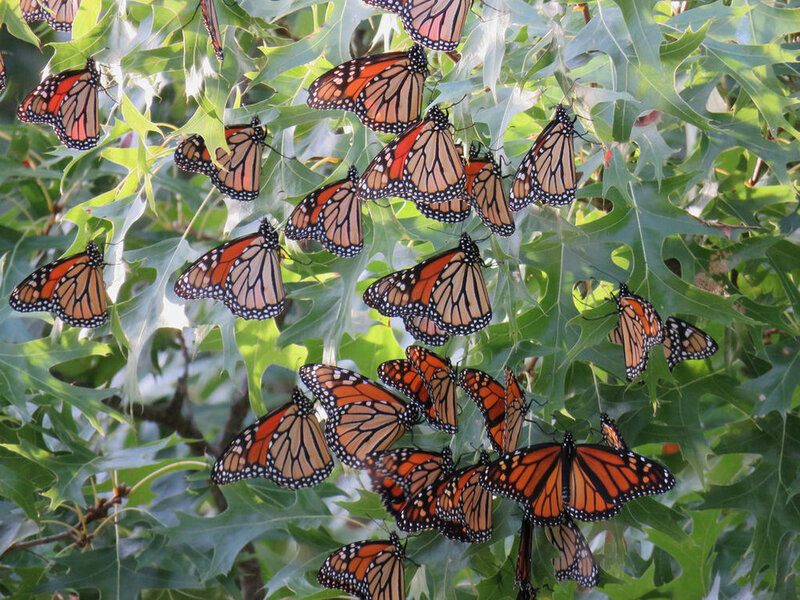 Roosting monarch butterflies. Image courtesy U.S. Fish and Wildlife Service. What is a brain for? One could argue that the whole point of the brain, and nervous system, is to change behavior in response to changes both within the body and in the external environment. To that end, being able to detect sensory stimuli and translate them into something that the brain body can use to guide behavior is very important. A fair amount of work has gone into understanding the senses that humans possess, but much less has been done to understand sensory systems that exist in other organisms, or to understand the span of all possible sensory systems and the encoding schemes they would require. Some particularly interesting senses found in other animal species allow them to detect polarized light and magnetic fields. Several hypotheses exist for the ability of some animals to detect magnetic field, such as the presence of tiny charged molecules that align themselves to magnetic fields and pass the information on to cells in the brain so the animal knows what’s going on. Another hypothesis involves the interaction between both polarized light and a magnetic field. Formally known as the cryptochrome radical pair hypothesis, the idea is that a protein called cryptochrome is first hit by ultraviolet light. This knocks an electron off of a couple of molecules (currently thought to be FAD and tryptophan, although who knows) , turning them into what is called a radical. Each year, the monarch butterflies migrate between Canada, the US, and Mexico. Image courtesy the Reppert Lab. Radicals are highly reactive and really want to get their electrons back, and so attempt to steal them from other sources in their neighborhood. Incidentally, this is also why you may have heard of radicals causing things like cancer in humans. Electrons in these radicals can have 2 different states, known as a singlet and a triplet, and the radicals will either oscillate rapidly between these, obtain an electron and convert to its previous state, or react with something else and form a product. When oscillating between singlet and triplet states, a radical has a probability of being in either, and it has been shown that even magnetic fields as weak as the earth’s can change the probability of these states. These states have also been shown to be susceptible to the angle of the magnetic field. The radical will interact differently with other molecules and can create different products depending on the state its electron is in. While most of the work on this mechanism has been theoretical and guided only by knowledge of a few protein structures and quantum mechanical simulations, it suggests a plausible hypothesis where by altering the probability of the creation of the product of the reaction, even weak magnetic fields could bias the downstream signaling of the protein, and thus alter the signals sent by the cells they reside in. The Reppert lab has provided some behavioral evidence in live animals that support the plausibility of the cryptochrome radical pair hypothesis. They have been studying the way monarch butterflies use polarized light to navigate using the location of the sun, even when the sun is not visible. Recently, they have been studying the phenomenal capability of the monarch to use the earth's magnetic field to navigate annually. They first placed 8 butterflies in an apparatus where a 141uT magnetic field was applied at 45 degrees. All of the butterflies flew in the direction of the magnetic field. They next flipped the field the opposite direction to -45 degrees, and all of the butterflies went the opposite direction. They also applied a field at 0 degrees, and found that the butterflies did not go in any coherent direction, suggesting they can only detect the inclination angle. They next put several light filters on the apparatus. One filter allowed only wavelengths of light greater than 420nm through (no UV light), while the other allowed wavelengths of light greater than 380nm through (includes UV light). With magnetic fields applied at 45 degrees, they found that the butterflies with the 420nm filter could not direct their migration towards the magnetic field, while those with the 380nm filters placed on their light could. This suggested that in order for the butterflies to detect magnetic fields, they needed access to light in the upper UV range, although ranges lower than 380nm were not tested, and the full spectrum butterflies (no filter) performed about twice as well as the ones with the 380nm filters on their lights, so perhaps visible light is useful as well. They suspected that the antennae were the source of the magnetoreceptors and UV light integrators. However, it was possible that they were using their eyes to navigate instead. In fact, their earlier work had demonstrated the ability of the compound eye in the monarch to use polarized and unpolarized light to navigate. To test this, the experimenters painted the antennae of 5 butterflies black, while painting the antennae of 5 others clear as a control. Applying the 141uT field at -45 degrees under full spectrum light, they found that the clear painted butterflies could navigate via the magnetic field, while the monarchs with black antennae could not. This demonstrated that the butterflies with the black painted antennae are not simply blind, but are not able to detect the magnetic field. These experiments had been performed with artificially high magnetic fields that are unlikely to be found during routine migration on Earth. They therefore repeated their magnetic navigation task on two populations of monarch under magnetic fields of 57uT, which is about what a butterfly would encounter in nature. They found that the butterflies could again be directed by changing the magnetic field even at these low field strengths. These experiments place more evidence behind the cryptochrome radical pair hypothesis. It is possible that cryptochrome in the antennae gets hit by UV light and forms radicals which are then biased by a magnetic field in such a way that they change the way the cells in the antennae communicate with the rest of the butterflies’ brain. Future experiments might look at the antennae in a dish, and record from output cells there while exposing them to polarized light and magnetic fields, to see if they really do communicate differently. Finding cryptochrome in the antennae, and a protein mechanism by which the different states might be converted to real signals, is also exciting future work. If achieved, it would be the first time a magnetic sensing mechanism is broken down into mechanistic detail and experimentally proven in a multi-celled organism. Reppert, Steven M., Patrick A. Guerra, and Christine Merlin. "Neurobiology of monarch butterfly migration." Annual review of entomology 61 (2016): 25-42.